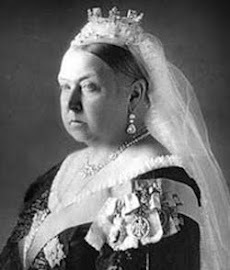 Two Victorian entertainers were honored by English Heritage with blue plaques last year. 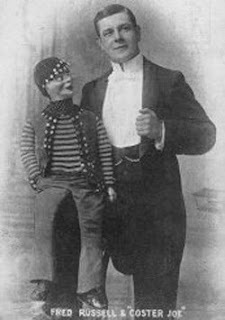 Fred Russell (1862-1957; born Thomas Frederick Parnell) is generally acknowledged to be the father of modern ventriloquism. Unlike other ventriloquists of the era, who worked with many dolls, Russell worked with only one, the Cockney "Coster Joe," which he perched on his knee. He was also a leader in improving conditions within his profession: in 1906 he helped create the Variety Artistes Federation, a trade union that later incorporated Actors' Equity. A plaque was placed on the house at 71 Kenilworth Court, Lower Richmond Road, Putney, where he resided for twelve years between 1914 and 1926. Russell lived long enough to perform on the Ed Sullivan Show in 1955. Wiki bio here. Recommended resource: Steven Connor, Dumbstruck: A Cultural History of Ventriloquism (Oxford University Press, 2001). 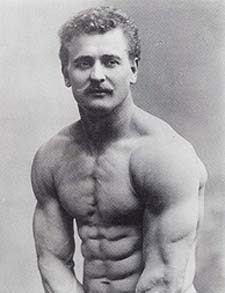 Eugen Sandow (1867-1925), known as "the forefather of bodybuilding," was a Victorian muscleman who became a freak show attraction in London and across the world for his extreme feats of strength. A Prussian by birth, he first appeared on the London stage in 1889. Eight years later he founded the Institute of Physical Culture, an early gymnasium for bodybuilders. In 1901, he sponsored the first bodybuilding contest: the "Great Competition" held at Royal Albert Hall and judged by himself, the athlete and sculptor Sir Charles Lawes, and Sir Arthur Conan Doyle. Sandow's life was commemorated with a plaque at 161 Holland Park Avenue, where he lived for 21 years. DNB bio here; Wiki bio here with great photos and useful links. Recommended biography: David L. Chapman, Sandow the Magnificent: Eugen Sandow and the Beginnings of Bodybuilding (University of Illinois Press, 2006). Great! 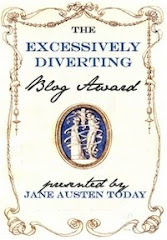 you can't make this stuff up, I think I might use this as basis of one of my future stories. Chance: I'm looking forward to seeing what you come up with! Be sure to check out the biography I mention...it's full of odd little gems like that one.